Betex® offers a wide selection of cylinder design, capacity and stroke to match your daily requirements. Built for Rugged Industrial/Construction use. All Betex® cylinders meet worldwide safety standards. Stop rings, plated pistons and heavy duty construction provide trouble-free operation and long life. Heavy duty, wound steel-plated springs provide fast and complete retraction, cycle after cycle, and retain their tension longer. Long-lasting springs contribute substantially to cylinder life. Threaded collars and internal plunger threads withstand full loading for maximum flexibility in fixturing. All Betex® cylinders incorporate a positive piston stop to limit piston travel at the end of the stroke, allowing the cylinder to be operated at full stroke. 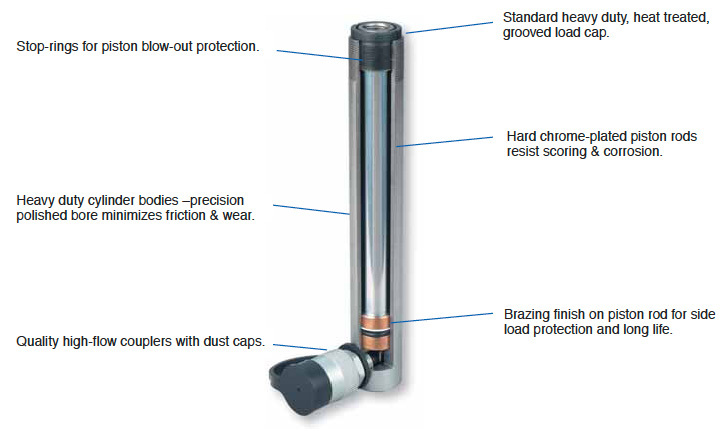 Piston stops add strength and safety to your Betex® cylinder. Rod wiper cleans the rod surface during retraction, protecting the inner cylinder assembly from dirt, moisture and other contaminants.